Take your favorite photo's everywhere! These 36 credit-card size prints, (54 x 86 mm or 2.1" x 3.4").. 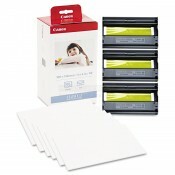 The KP-108IN Color Ink And Paper Set from Canon is a special package that includes both paper and in.. 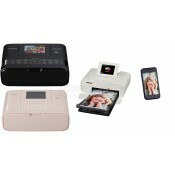 The SELPHY CP1200 Wireless Compact Photo Printer is so much fun to use, you'll want to take it every..
Come With 1 Year Local Canon Warranty + 3 Months Extended Warranty If You Register Your Warranty Onl.. The PCC-CP400 Card Size Paper Cassette from Canon allows your SELPHY printer to use card-sized paper..
You can attach the adapter directly to your Canon Selphy printer CP910 or older models (require NB-C.. Note: You will be given 3 boxes (36 sheets) of Compatible KP-36IN as this 108 sheets pack is current.. The compatible KP-36IN Color Ink And Paper Set is a special package that includes both paper and ink..
With this compatible NB-CP2L battery, you can attach it directly to your Canon Selphy printer CP1300.. This protective case with built in cushion prevent your printer from damage during traveling. There ..